The shells of the Mirage Raven Drum kit are wrapped in a black PVC making them clean looking yet very striking in stark contrast with the chrome and dark chrome hardware, and would look cool in any practice space! Posted on 25/06/2014 by Clemmie For this price to get a new full size kit is great. My son got this for his 7th birthday and really loves it. It would have got a 5 star rating but for the lack of instructions on how to assemble and how to tune it, so I only gave it four. I downloaded the picture above to get an idea how to assemble, not that hard really but the picture was a useful tool. 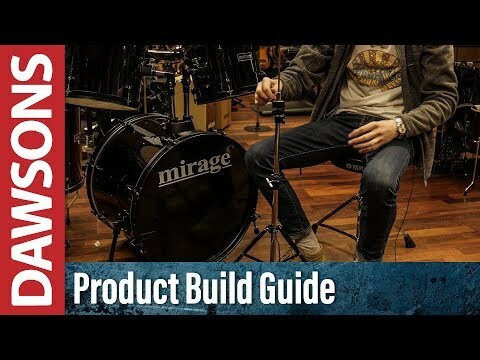 Overall as a starter kit this is a great and cheap way of starting out as a drummer. Posted on 14/08/2013 by chazzy p This drum kit is a great piece of equipment for any Keith Moon or John Bonham 'wannabe's' on a budget. This is my first drum kit and I am very proud to own them. The only thing is when you hit the bass pedal the bass drum leans slightly forward, but that isn't really a problem. Posted on 17/12/2012 by Jack This is a great kit, at an affordable price. Had it for a year now and I have upgraded the skins and cymbals from the originals, however the original kit is great and, as I have done, it’s easy to upgrade. Posted on 25/09/2012 by Joe B If you're looking for an effective way to enhance your drumming skills without breaking the bank, then this kit may be what you are looking for. With a good range of sturdy, reliable materials, the kit offers an authentic sound for many styles of music; from rock to jazz. Also, these drums are good at taking a hit, so if you've been pumpin' the gym lately, don't worry, the heads are sturdy and will be able to take a considerable amount of force when you play. However there are one or two criticisms about this kit. Number one - it tends to slide forwards slightly when hammering hard on the bass pedal. Number two - the cymbals can sound quite brassy when playing lightly on them (the ride for example). But all in all this is a kit well worth the wonga! With great sound and practicality, you'll be able to develop your skills, and enjoy your music that bit extra. Posted on 05/01/2012 by sean from luke and the doritos These are my first drums and they are great - really suits my band and me!